In this prequel to Rosen's exemplary 2011 title All Cry Chaos, we meet Henri Poincare as a young man, a newly-minted engineer who has helped design and build a diving platform to recover gold from a ship sunk in 1799 off the coast of Holland. While there he meets a beautiful young woman, falls in love--then meets her family. The Krauses are steelmakers, among other things, and began their rise to great wealth as suppliers to Hitler's Third Reich. The company managed to prosper beyond those dark times because ten of the Jewish workers at the Kraus factory signed an affidavit to the effect that Otto Kraus was a benevolent boss who cared for his workers and saved many lives. Now the survivors among the ten are dying at an alarming rate--some from apparently natural causes, one from a fall from a window. As Henri investigates he finds himself imperiled and then devastated by horrific acts of violence past and present. 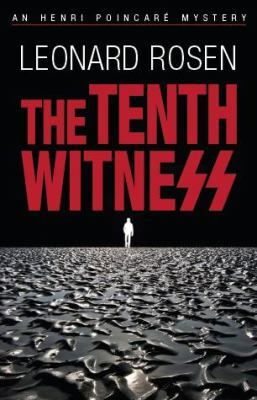 The Tenth Witness is a thoughtful, literate thriller, characters well established as the suspense begins to build. One of Henri's worst moments is when he finds in his own heart a bit of the terrible darkness he is beginning to see in others. One of his best is when he risks his own life to bring a monster to justice. Rosen's Henri Poincare books are so well-written and memorable, one earnestly hopes he will write many more volumes filling in the blanks between Henri's younger self in this book, and the older man of All Cry Chaos.